If you don’t regularly attend Mass with a toddler, then you probably have a fantastic spiritual life. You probably arrive to church on time or even early. You get to listen to the readings and homily. You don’t just spout out responses from rote memory instead of a place of true spiritual understanding. You get to attend Mass without carrying Cheerios, an extra diaper and some sort of book about Jesus that you hope is interesting enough to keep someone’s attention for an hour. Or, maybe you do struggle with this stuff, because, well, we are all human and it happens. Regardless of the reason, I think we all occasionally find ourselves in Mass thinking about anything but Mass. And, because this season of my life means that this happens to me more often than not, I have had to come up with a few ways to participate in Mass the best I can in hopes of providing some sort of example for my kids. After all, Matthew 19:14, right? Communion is a hard time for us in Mass. Some people are sitting, some are kneeling, some people are getting up to walk in line. Some people sing, some are silent in prayer, and this is all incredibly distracting for a toddler – and therefore, me. So, while I am looking around, I try to notice the people in the church. I look at their faces, their children, their emotions, and I simply ask God to bless them. If this is the only prayer I can manage during this time, then darn it, I’m doing it. But, you know, that’s not the only prayer I can manage. Sometimes I find myself just repeating the words “thank you” or “help”. I might even just list my joys and concerns in litany fashion. The Lord knows my heart, and he knows what I need. I know my prayers are often feeble, but thankfully He is there to take care of the rest. I love when churches provide missals. I am already a visual learner, so I have a hard time focusing without something in front of my face. Having the readings in front of me gives me a guide to follow along with. I can also use it with my kids and run my fingers along the words as they are read. This works about 40% of the time… If the church I am visiting does not provide missals, there are other options: bring your own, download one on your phone (I am seeing this more and more), or read the readings ahead of time or afterwards. So, while I am in a time of my life where church is more about teaching another person how to behave and how to pray the Mass, I am not able to really immerse myself the way I tried to before children. These simple things might seem insubstantial, but they make all the difference in my experience. What tricks do you have for participating in Mass when it seems impossible? These are great ideas! We have 4 kids (currently 8, 6, 3, and 8 months) so Mass can sometimes feel like a 3 ring circus! Easter was a prime example because we were at a different church (out of town) so everything was new and exciting. Our middle son (who has ADHD) couldn’t sit still, our 3 year old had to be taken out on several occasions, our 8 year old was whinny and kept trying to lay down and the 8 month old wanted to be fed but the cry room was full! A long time ago I decided that if the only thing I get out of Mass on occasion is Communion than that is enough for this stage of my life. I think changing our expectations can help a lot! Right now Mass for us is about teaching our children to sit, stand and kneel when appropriate. Teaching them prayers and responses. Getting them to join in songs. Some weeks I get more out of Mass than others, but once I stopped putting so much pressure on myself to have perfect children at Mass it helped so much! Some of my favorite tools aren’t for me but for them. Having age appropriate Bibles, Mass books and other religious books. Printing coloring sheets from Catholic Mom and other Catholic sites. They aren’t allowed to take toys, food or drinks (except for the infant. We have certain quite toys he can have at Mass and we’ll take some puffs for him to eat). Sometimes if I can keep them “busy” during the readings and Homily they are ready to participate during the Eucharistic prayers and Communion. Those are good days! Sorry for the book! I just feel passionate about this topic! lol Thanks again for some great tips! I’m going to give these a try! You’re totally right – changing expectations is huge. I have had to shift from thinking about Mass as about me (which it never was to begin with, duh! ), to being about teaching my children. Mass, of course, is about Jesus, and I think nothing makes him happier than to see parents teaching their children how to worship Him! Haha….remember, mine were part of the screaming banshee mob in the back of the church at Easter. I find that if we are able to sit closer, that sometimes helps too because she can see what is going on. We also bring kids prayer books so we can follow the Mass with her, though she is noticing that her books are different and is rather indignant about that right now. She wants the grown up missal. All in all, it isn’t just about changing expectations, but also perspective. I find that I get ridiculously upset because I feel like people are judging me (probably because I was a former judger myself…oh how the tables turn!) I realized that I needed to attend Mass on her terms to a degree and realize that this stage too shall pass. For now there is no reason to force her to sit still beyond her capacity and lead to an unavoidable meltdown. If we have a gathering area where she can have some more space and we can still participate in the Mass, what’s the big deal? Jesus always deals with us where we are, so why should I treat her any differently. I find the days I just give in to working on her level, I get more out of Mass too because I’m not tying myself up in knots trying to get her to behave in an adult fashion. She’s pretty precocious, but she is 2. I love that idea of Jesus dealing with us where we are. Isn’t that the truth? We have always taken all children with us to Mass. With two sets of twins its no small feat. We have a “church bag”. It includes board books about Jesus, stickers/paper, and such. The more I explain what is happening the more apt they are to listen. Now the two sets are 7 & 4 and they actually sit and listen to 80% of Mass. Which means I get to as well! And, you’re right. When I think about it, I notice that if I whisper to her about what is going on in the Mass, she pays pretty good attention! Great suggestions! It’s nice to know I’m not alone in this struggle, and it’s important to remember that this phase too shall pass. I would add that I try to make an effort to pray for each of my children (ages 10, 8 and 3) before mass—especially imploring the Holy Spirit to fill the 3 year old with obedience and a quiet voice(ha!) 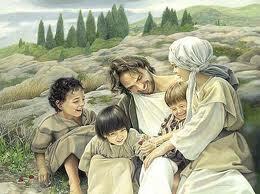 and that they will each grow in holiness through that time with our Lord. My other suggestion would be to consider sitting as close to the front of the church as possible. I know this may seem counter-intuitive, and it may make for a long walk out to the gathering space if needed, but I truly feel my kids are better behaved and more engaged when they can see what is going on. Thanks again for sharing! So we’d sit right up front and point out everything happening in hopes that a portion of the Mass was getting into their heads. Eventually, they started looking on their own. The other thing we did was that I took them to daily Mass (starting when they were about 3 & 6) for a while. The shorter Mass (yay) combined with the repetition and extra exposure helped them to learn how to behave at Mass all the time. You know, when I think about it logically, you’re right. I am a short person, and when I sit in the back, all I really see is the back of people’s shirts. I find my own mind wandering. And then I expect a toddler to pay attention. Yeah right! Up to the front we must go. Now we just need to get to Mass before the opening song starts! hahaha You have taught him well, I see! I wonder if we sat right next to the band or choir if that would help too. I can’t hurt to try! Our family sits in front and that helps a lot. Occasionally I will point the cross out to my five year old and say, “Jesus died on the cross for us, the least we can do is be still and listen.” I also will sometimes bring a children’s Bible. My kids like to do what we are doing so if they have a book then they are more likely to be still as well. It certainly helps that my son loves music… Some masses he is good throughout, only wanting to be held. Some masses, he makes it through the 2nd reading… I grab the missal & bag, take my little one out to the vestibule (this is where the quiet 24 piece puzzle comes into effect) where I can hear the mass from the loud speaker. I read. I also sing into my son’s ear… I come back in for Communion & my son walks up with us as a family. He LOVES it. He also gets a blessing. He smiles & watches. I can tell just from this comment that you are a really loving and involved mom 🙂 It just makes me smile to hear that you are so proactive in his faith life! hahah! Yes, that sounds about right! It’s amazing how much more interesting all of the little papers and what not at church are than anything you bring to keep them busy, ya know? We have 5 kids ages 17- 2 years old. We try to sit right up in front of Jesus. That helps so much! Going to mass in the morning is always better then 530 on Saturday as the kds are tired and hungry later in the day. Our church has donuts and fellowship after mass which might be the ONLY reason the little ones like to go to mass! Lol. I think sitting in the front is a big theme in the combox here. Ya’ll must be on to something 😉 And yes, donuts are usually a very good bribery tool haha!